This week I had the pleasure to assist our RSM, CWO Sophie Fraser (Grade 12) in hosting the Annual 254 King’s-Edgehill School Cadet Corps Sergeant Mess Dinner. The event was spectacular. Right from the moment when the guests entered the Stanfield Dining Room/McLellan Annex and were greeted by a receiving line of Senior NCOs and Warrant Officers, I was struck by the professionalism of the Corps. They were not just well turned out in their Highlands, rather they were finely tuned as a unit. As our PMC MWO Nicholas Cheverie (Grade 12) noted the meal was indeed exemplary. Our kitchen staff really know how to turn on the juice when it comes to a formal dinner. The main course was tasty, the dessert was superb and what more could be said about the fair Haggis. It is definitely an acquired taste. However, as Mr Seagram will point out, this School is the place to try new things so, if you are going to sample Haggis, your first experience should be the batch prepared by Chef Keith Miller. It was outstanding. The Ode to the Haggis was a performance in itself. MWO Ben Lohr (Grade 12) and WO Ella Brown (Grade 11) fielded great Scots accents and wet our appetites for the fine pudding. The song stylings of Drum Major Joanna Bond (Grade 12) and the accompanying piano paying by Sgt Elizabeth Walsh (Grade 12) set a beautiful tone for a relaxing evening. Who could top WO Max Cole (Grade 11) and his lyrical response to the Ode to the Haggis in defence of Dessert? A first for the Corps this year was the Sword Dance. The team of Ms Meghan Keoughan (Faculty), WO Kelly Bouwman (Grade 11), Sgt Deanna Fraser (Grade 11) and MCpl Rhyan Rusaw (Grade 10) were flawless. Dancing to the bagpiping of Mr Pat Le Poidevin (Faculty), they put on an incredible display of Highland Dance worthy of any BlackWatch Mess. Many thanks to these two fine faculty members, and our three cadets for the energy they put into the programme. Our Keynote Speaker, Ms Jennie King, gave a resounding speech in support of youth leadership and perhaps charted a course for our coming graduates. Many thanks to her for her wise words. Of course all of this stuff does not just happen. It is created from the ground up. I send out a special word of thanks to Ms Morgaine Sullivan (Class of ’09; Staff) in support of the extreme amount of dedication that she put into this highly successful event. Well done, Morgaine! This was another successful dinner for the annals of the Corps. What a great day to be a Cadet in the 254! We uphold a long-standing, Canadian tradition that teaches discipline, leadership and service, but it is anything but stuffy. 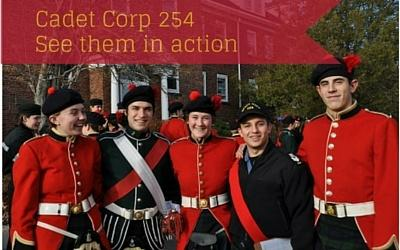 Download our Cadet Corps PhotoJournal for pictures and more.